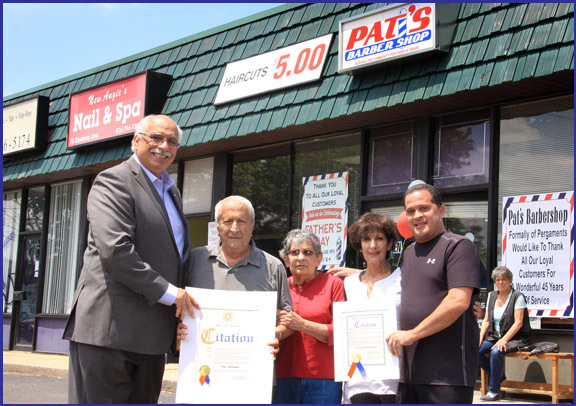 Nassau County Legislator Dennis Dunne, Sr. was delighted to celebrate Pat’s Barber Shop’s 45th year in Levittown with a citation honoring the business’ dedication to the community. Legislator Dunne wishes Pat’s Barbershop many more years of success. Pictured from left to right are Legislator Dunne, owner Pat Palumbo, Carmella Palumbo, Rose Drummond, and Charlie Palumbo.